Of all today’s woodstoves, the Progress Hybrid achieves the highest BTU output during EPA testing - 73,171 BTUs/hr. Perfect for large, or older drafty homes. See for yourself on the EPA’s website. 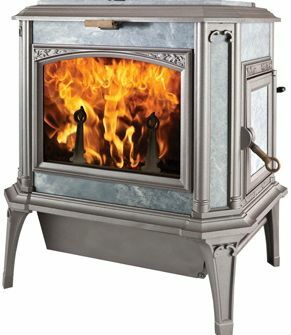 Some stove manufacturers exaggerate heat outputs; EPA reporting is the bottom line. Heats up to 2200 square feet. Low emissions of 1.3 g/hr. Away all day at work? Away overnight? The PROGRESS Hybrid will easily burn 12-14 hours or more on one load. When you return, your stove will still be warm, thanks to soapstone’s unique ability to hold coals and achieve long burns. Our catalytic combustor assures that even during very long burns the stove performs efficiently and cleanly. It’s more efficient than other stoves, so you get more heat at lower outputs than with other stoves. With our hybrid technology, you can burn very low or very high heat and still get more heat per pound of wood. Call 1-800-866-4344 for a freight quote.